The poster went on to describe the situation with a customer who insisted that the plumbing work recently completed was now causing a huge flood in their front yard. Turns out the issue was with the next door neighbor’s plumbing and not with the work done by my “friend”. The customer was extremely caustic, threatening and demanded that other customer’s service be pushed aside for their service call. At the end, neither a sign of appreciation or thanks from the customer. Is it risky to point out bullying customers? I admit to posting on Facebook about situations with customers. Of course I always protect the guilty with no gender or company. Do you know how hard it is to write using neutral tones when you want to yell their names for the world to hear? Why is it that Yelp allows people to post positive and negative posts about your business… but there is no recourse to enable you to inform other companies to beware of customers who will never be happy and will always find something wrong? 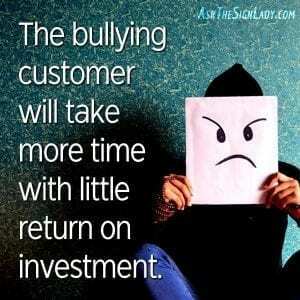 The bullying customer will take more time with little return on investment. They will dangle out there that they are growing and if you are quoting graphics for one vehicle, they want a discount based on the 20+ vehicles they will have at some undetermined time in the future. They make dozens of changes to designs, then return to the original one that you suggested in the first place. They don’t respond to phone calls or emails to approve their proofs and then complain that their sign took too long to make and they should get a discount. They make demands on staff to the point that no one wants to take their calls. Yes… we have caller ID. 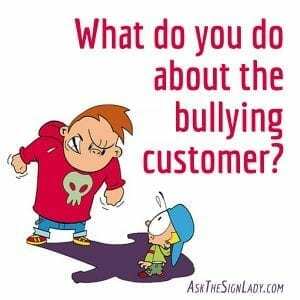 What do you do about the bullying customer? You fire them. We tell them that we are not a good fit for them and their expectations. Some hang up never to be seen again (Whew!). Others… well, they turn out to be some of our best customers. Just like friends and family, sometimes you have to clear the air and set boundaries. Is it risky? Maybe… but In the new world of sales and marketing and business development… sometimes the customer isn’t always right. I’d rather risk losing customers who don’t appreciate me and my team and waste our time, than risk losing our best customers because we are preoccupied trying to satisfy someone who will never be happy. If you are reading this, then know that you are one of our favorite customers. 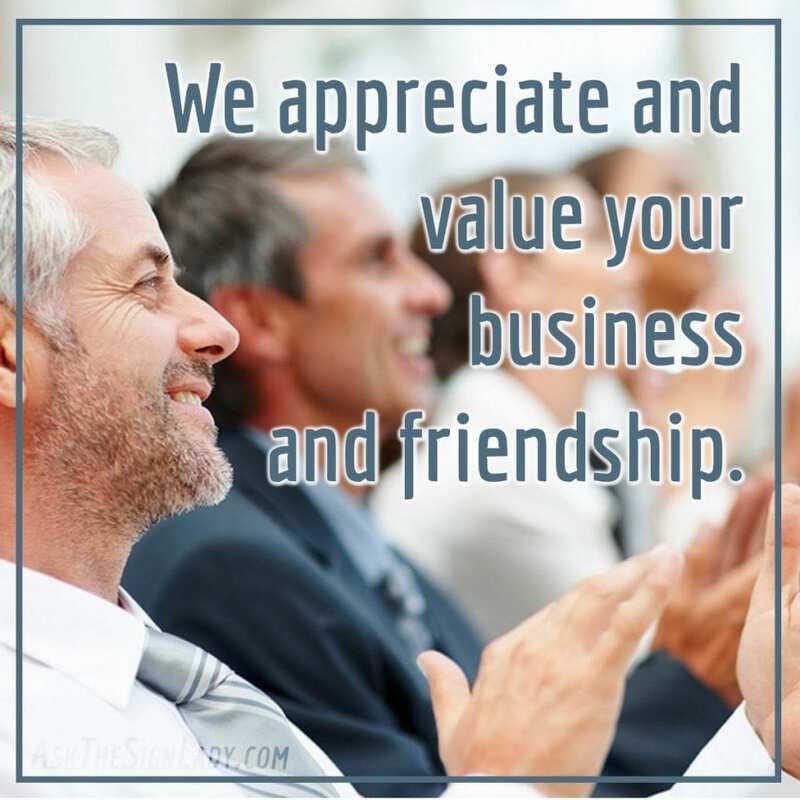 We appreciate and value your business and friendship.